Swing into a hand-drawn, action-packed arcade adventure game where you&rsquo;ll unite every Spider-Man and Spider-Woman against the ultimate threat! &bull; Enjoy the thrill of the first amazing Spider-Man arcade web-runner! Swing, run and fight through chaotic NYC in over 7 different environments! &bull; Go beyond an endless runner game with superior fighting and running gameplay! Combat dimensional super villains, web-swing, go running up walls and perform skydives! &bull; Play story mode with 5 boss battles to fight and 25 missions per Issue! The action never stops with new daily and weekly events and spectacular rewards in Events Mode! Or run to the top of the leaderboards in Unlimited Mode! &bull; A continually running, episodic adventure game: The Sinister Six are moving from dimension to dimension, destroying everything in their path &ndash; and our world is next! But this ultimate army of Spideys is fighting to give the Six a run for their money! &bull; Dive into an extensive Marvel Universe spanning over 50 years of Spider-Man with iconic characters, including dimensional Spider-Men, multiple variations of each villain, as well as Nick Fury, Mary Jane, and Black Cat! &bull; Written with an experienced Spider-Man comic writer to ensure a faithful recreation of the Spider-Man comics in an arcade running game! &bull; Summon, collect and play as tons of Spider-Men and Spider-Women featured throughout the Marvel Universe, including Superior Spider-Man, Spider-Gwen, Scarlet Spider, and Ultimate Spider-Man! 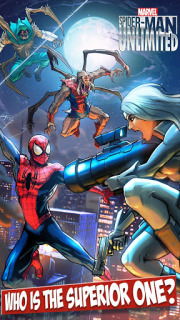 &bull; Collect, fuse, and level up your cards to make the ultimate Spidey runner. Each has their own unique super-powers to help fight through Spidey Ops missions around NYC! &bull; CONSISTENT RELEASE OF NEW SPIDER-MEN AND SPIDER-WOMEN! &bull; An amazing cel-shaded art style inspired by the Marvel comics. &bull; Super-smooth graphic animation that brings your runner&rsquo;s every action to life. Farm Frenzy Lite For ..